Antique - Lustreware, Very Thin, or Opague China Tea Set - Hand Painted - Made in Japan from the 1920's & 1930's - Totaling (9) Pieces - A great "Tea for Two" Set. 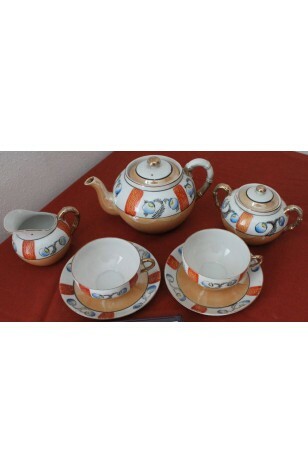 This Antique Lustreware (9) Pieces Tea Set is hand painted in Japan. Very Thin or Opague, but has stood up through time. A Lovely White Background with Orange Lustreware, Darker Orange Sections (Stripes). Blue and Yellow Flowers, Black Feather Foliage. These Pieces are Trimmed in 22kt Gold, with heavily Hand Painted Handles which look as Bamboo. A beautiful, and truly "Tea for Two" Set. 2 - Saucers - 7"